We’d love your help. Let us know what’s wrong with this preview of Superhero Ethics by Travis Smith. Although these outlandish figures—in their capes, masks, and tights, with their unbelievable origins and preternatural powers—are often dismissed as juvenile amusements, they really are profound metaphors for different app Whether in comic books or on movie screens, superhero stories are where many people first encounter questions about how they should conduct their lives. To ask other readers questions about Superhero Ethics, please sign up. Mr. Smith dissects the internal dynamics of ten superheroes. Most are very popular like fan favorite Wolverine (my husband's favorite), Iron Man, and Thor to name a few. As well as maybe lesser superheroes Green Lantern and Mister Fantastic. Yet, when you read this book, you will understand the reason why Mr. Smith chose to feature the superheroes that he selected. The Best of the Beastly featuring the Hulk vs. Mr. Smith dissects the internal dynamics of ten superheroes. Most are very popular like fan favorite Wolverine (my husband's favorite), Iron Man, and Thor to name a few. As well as maybe lesser superheroes Green Lantern and Mister Fantastic. Yet, when you read this book, you will understand the reason why Mr. Smith chose to feature the superheroes that he selected. The Best of the Beastly featuring the Hulk vs. Wolverine, Beacons of Imagination featuring Green Lantern vs. Iron Man, Responsibility and the City featuring Batman vs. Spider-Man, Ideals in Action featuring Captain America vs. Mister Fantastic, and Gods in a Longbox featuring Thor vs. Superman. Superheroes are one of the biggest money grabbers of the twenty-first century. Fans around the world love flocking to the world’s of Marvel, DC and other comic book publishers who make the most popular comic books, films, television programs and more. Yet there has been one question that has always been on fans minds since the comic book industry began: who is the best of all the heroes? While t I received a free copy of this book in exchange for a fair and honest review. All opinions are my own. 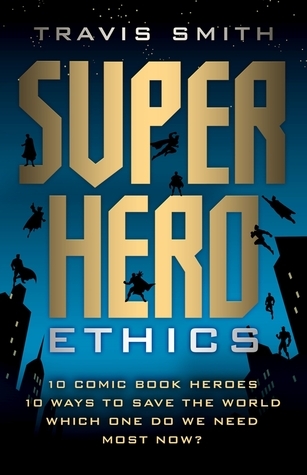 The subtitle of Super Hero Ethics is: 10 comic book heroes, 10 ways to save the world. Which one do we need most now? My husband loves superhero movies, as do two of my sons-in-law and numerous grandchildren. Until now, I have tried to stay away from the compulsive watching and the related arguing about the relative merits of one or the other superhero. When the publicist sent me Super Hero Ethics, I realized that it seemed like the next good read for my husband and me to delve into. We enjoyed reading the book very much, especially the ways in which the personalities and ethics of the ten highlighted superheroes reflect the ethical and political mores of our country—currently. So, with that ethical high ground in mind, Smith compares the Hulk and Wolverine, Green Lantern and Iron Man, Batman and Spiderman, Captain America and Mister Fantastic, and Thor and Superman. Smith has an intimate relationship with the comics and movies that have fueled the history of superheroes. He looks at these superheroes through Christian eyes, although his emphasis is not overtly Christian in focus. In the last chapter, he crowns the most ethical hero. I am a novice at this stuff, as I said. I didn’t know, for instance, that there was a rivalry between DC and Marvel, although to my credit, I had heard the name Stan Lee. I do watch the Big Bang Theory on occasion, so I am familiar with people debating superhero strengths. For a while, one of my nephews dressed only in Captain America clothing, and my little grandson is Ant Man for Halloween this year. With this book, however, I rapidly became an expert. I had never heard of Mister Fantastic, so we watched the Fantastic Four movie the other night, and just last night we watched Thor Ragnarot so we could understand Thor a little better. Now, I am up to date and feeling really trendy since we finished the book this morning. One thing I loved about Travis Smith and Super Hero Ethics is that it was philosophical without being stuffy, and I also loved how devoted Smith is to these characters. My husband and I both agreed on Smith’s reasoning for picking the super-superhero he chose. I do wish, however, he had focused a little attention on Wonder Woman, my own personal superhero. Super Hero Ethics is a geeky but fun read. We recommend it. One more thing—if Travis Smith uses this book in his political science or ethics classes, I’ll bet his classes fill up in a second. A lot better than the Ethics textbook I had to read. Really enjoyable, riding that perfect line between obvious comics nerd and scholar. It's clear not only that Smith has done his homework, reading years' worth of comics and watching movies, but he didn't do this research FOR this book, but rather out of sincere engagement with the storylines and characters. To be honest, I'm kind of so very very over the proliferation of superhero content pervading American life, but I heard an interview with him that just caught my intention. So, authors, pleas Really enjoyable, riding that perfect line between obvious comics nerd and scholar. It's clear not only that Smith has done his homework, reading years' worth of comics and watching movies, but he didn't do this research FOR this book, but rather out of sincere engagement with the storylines and characters. To be honest, I'm kind of so very very over the proliferation of superhero content pervading American life, but I heard an interview with him that just caught my intention. So, authors, please do interviews on podcasts and new media as often as possible, because they do get the word out. He sets up the book as that classic comics nerd (I keep wanting to say 'fanboy' but that term has become poisoned by gross people) game of imagining one-on-one battles between various characters. It's not exhaustive--all of his characters are white and male, which I'm sure other reviewers are going to jump all over, somehow not realizing that for the vast majority of comicsdom, the heros have been...white and male. And his focus in on American culture as the 'world' he's talking about saving. So I don't mark that as a ding against his work, though of course, I'd love to hear his take on someone like Black Widow or Black Panther. His matchups aren't in terms of superpowers, which are beyond your reach, but in powers we, any reader, can emulate--social engagement, neighborliness, the balance of force and intellect, etc. It's quite an inspiring book, because it emphasizes something I've come to realize is taught increasingly less and less to young people--ethical character. My Recommendation: Even though I had a HUGE issue with the lack of women in the 10 superheroes, I feel this is an interesting read. It takes 10 archetypal/stereotypical superheroes explains they're strengths and weaknesses, pits them against their equal in various reasonings (locale, god like stature, intellectualness, etc. ), and then explains why the superhero as a whole is more worthy of civilization modeling our momentum forward after that superhero. The chosen victor caught me off guard, bec My Recommendation: Even though I had a HUGE issue with the lack of women in the 10 superheroes, I feel this is an interesting read. It takes 10 archetypal/stereotypical superheroes explains they're strengths and weaknesses, pits them against their equal in various reasonings (locale, god like stature, intellectualness, etc. ), and then explains why the superhero as a whole is more worthy of civilization modeling our momentum forward after that superhero. The chosen victor caught me off guard, because of how over-the-top his love/adoration/man crush was on another character, but it felt right when I closed the book. After saying yes and reading this, I'm not sure I should have. There were some major flaws in this book mostly having to do with gender and misogyny. I don't want to harp on about this, but that's probably what this post is going to end up being. Smith chose 10 comic book heroes (first appearances): The Hulk (1962), Wolverine (1974), Green Lantern (1940), Iron Man (1963), Batman (1939), Spider-Man (1962), Captain America (1941), Mr. Fantastic (1961), Thor (1962), and Superman (1938), and pitted them against each other in an "epic" ethics battle. What's the obvious thing about these ten heroes? They're all men. [Want to skip this tirade? Skip 6 paragraphs down. Click here to continue reading on my blog The Oddness of Moving Things. Despite the heavy philosophical and sociological discussions, it is very readable. The author is obviously a fan of the comic genre, and the human condition. The book was enjoyable to read, and it made me think about both the personal and societal ideas discussed. Nerdiest book I've ever read. I wish I'd written it. This book was absolutely phenomenal on many levels! Must read. Full review to come.